The rooster is the tenth animal in the Chinese zodiac and those born in the Year of the Rooster are loyal, trustworthy, observant and keen to offer their opinions to those around them. 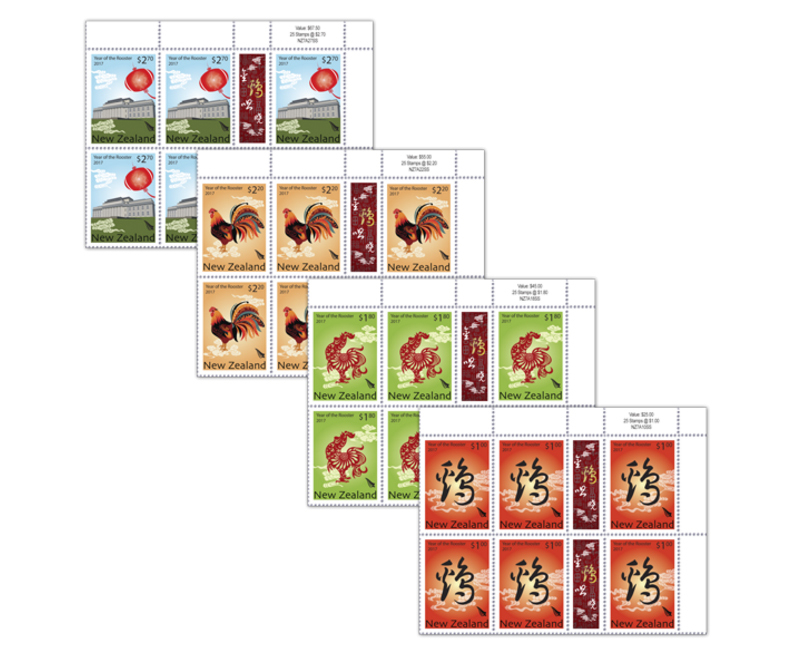 Coloured and Numbered Miniature Sheets. 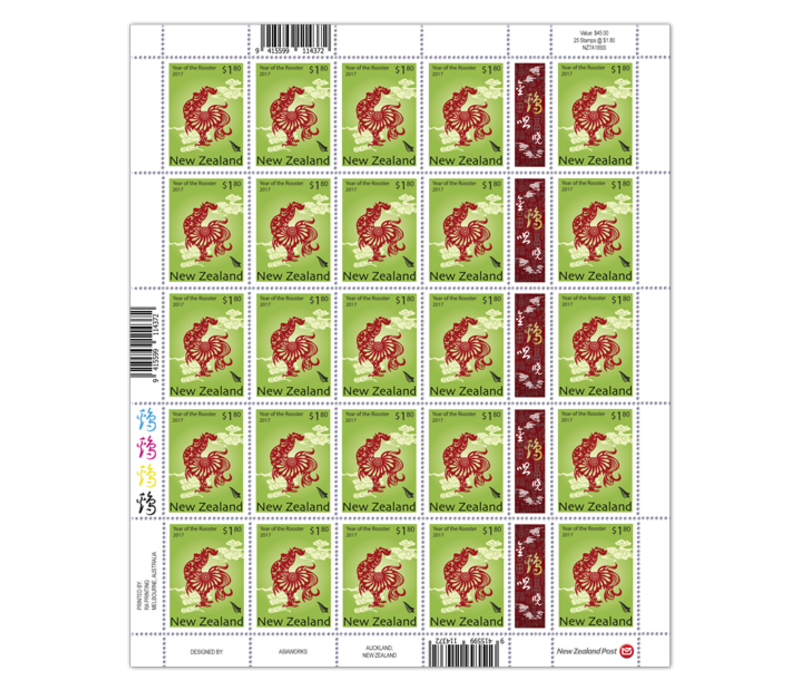 This large miniature sheet is one of only 25 lucky-numbered miniature sheets to feature colour on the stamps. 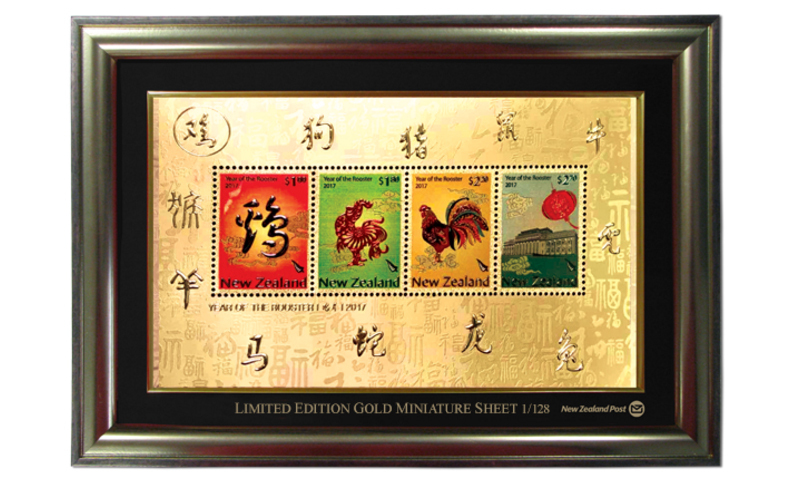 It has been embossed and etched with micro fine detail from 24-carat 99.9 gold foil, and is presented within an individually numbered frame (measuring 39cm x 27cm). 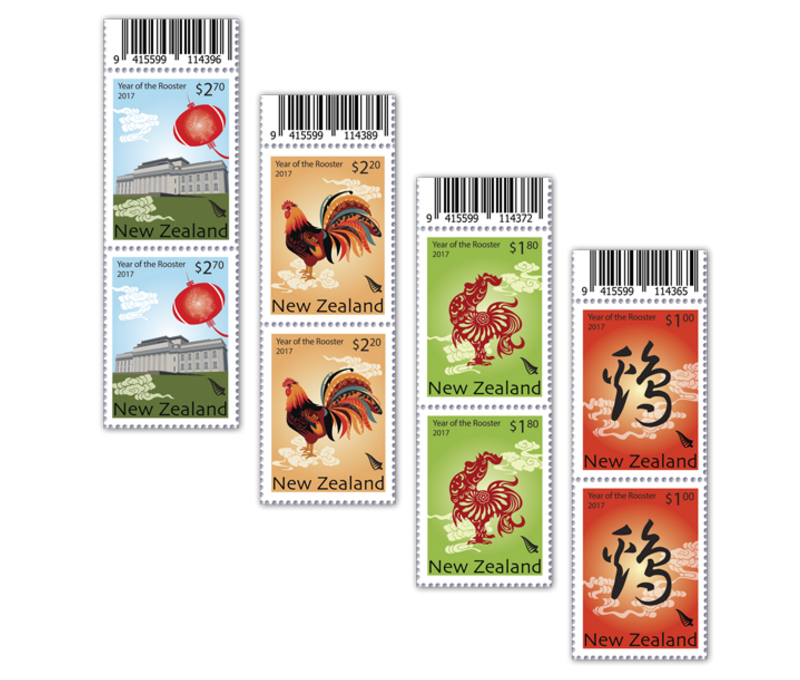 The four gummed stamps in this issue are inspired by the Chinese folk arts of calligraphy, paper-cutting and line-art illustration, and they celebrate the multicultural nature of New Zealand with both Chinese and New Zealand elements. To add to the special nature of this issue, the sheets of stamps contain unique gutter-pairs. 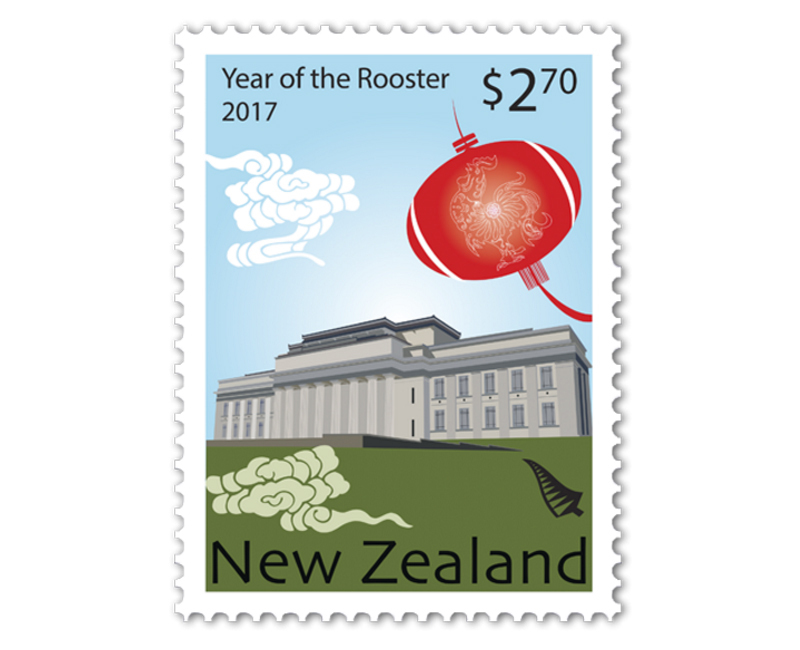 The red colour of this stamp represents the traditional colour of Chinese New Year, which mirrors the positive holiday atmosphere. 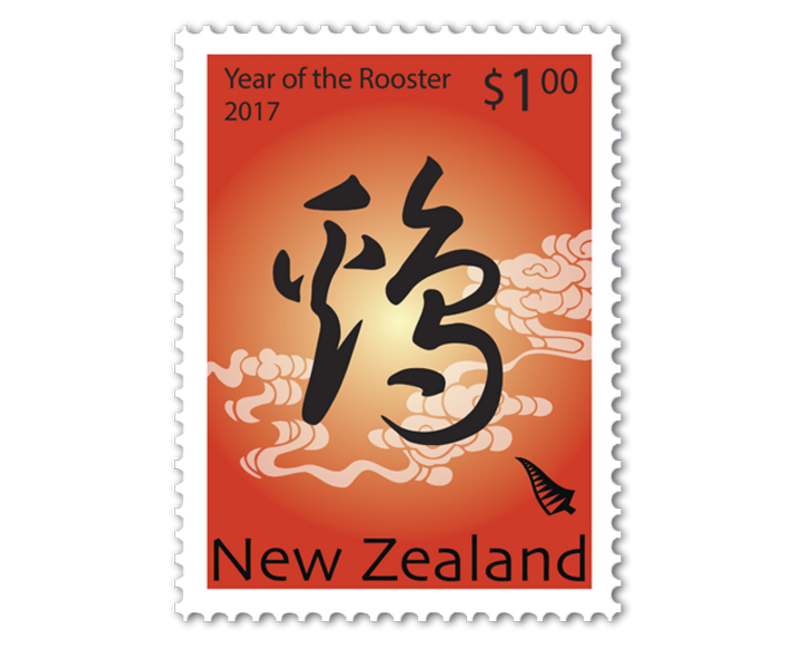 The calligraphic character of ‘rooster’ has been designed in a ‘paint-brush’ style and can be seen as a decorative element throughout Chinese New Year celebrations. 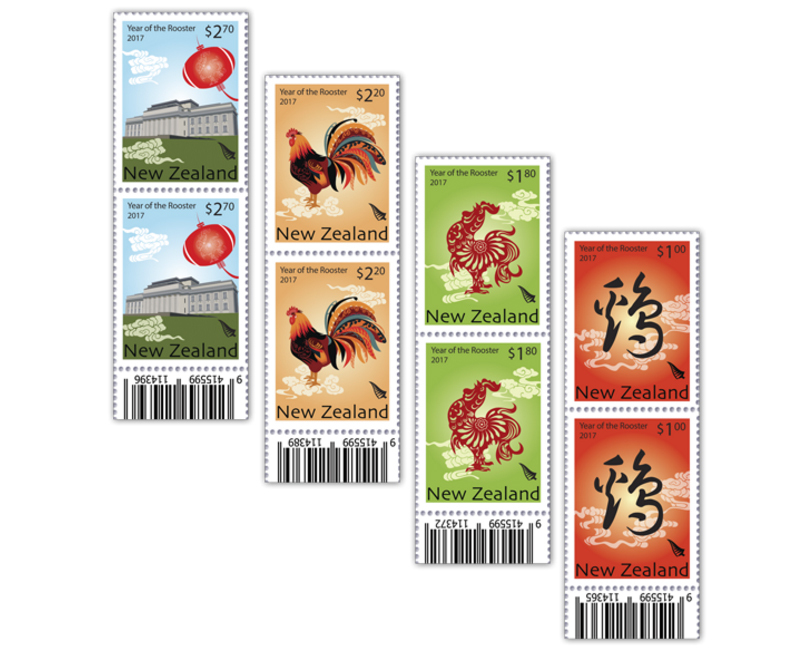 The cloud patterns are employed extensively in all four stamp designs, and reference New Zealand as ‘the land of the long white cloud’. 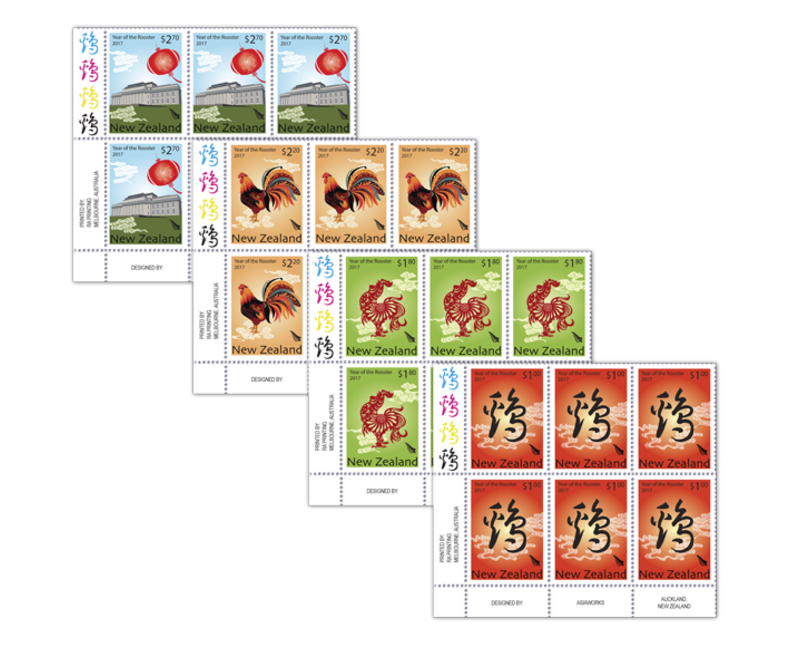 One of the commonly used decorations for Chinese New Year is paper-cutting, which can be found everywhere from shop windows to private homes. 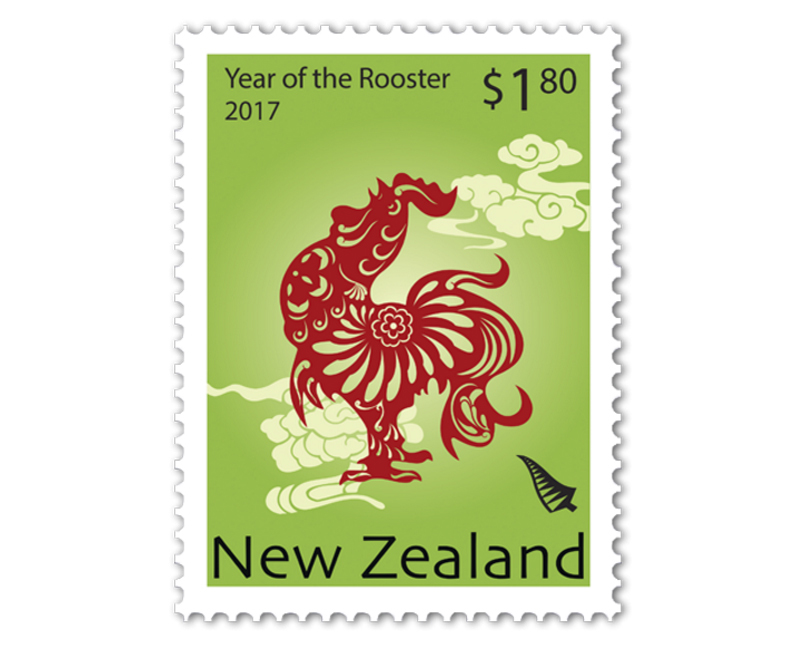 The intricate art of paper-cutting dates back thousands of years in China, and the rooster depicted in this paper-cut symbolises a vibrant and positive start to the day. 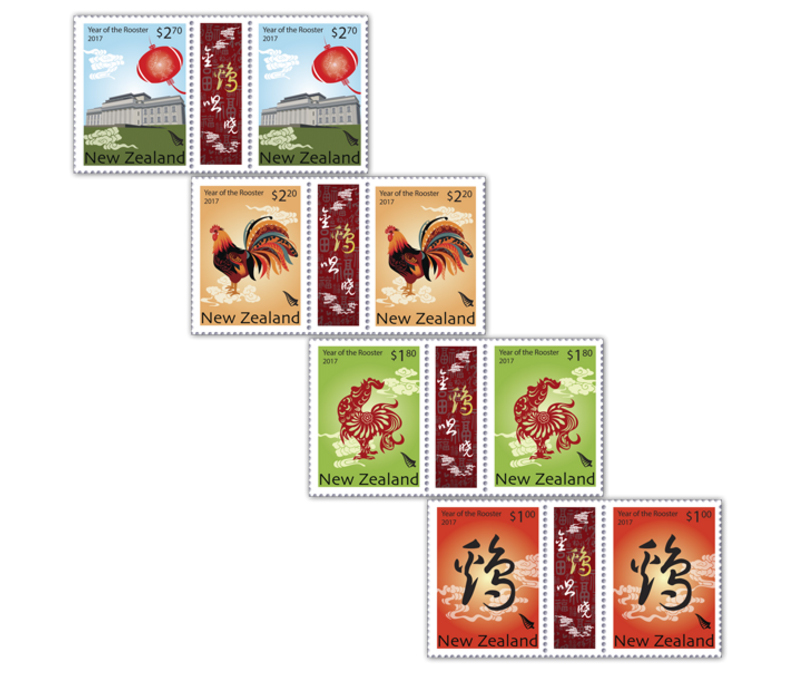 The Maori motifs incorporated into the paper-cut bring the diverse Maori and Chinese cultures together. 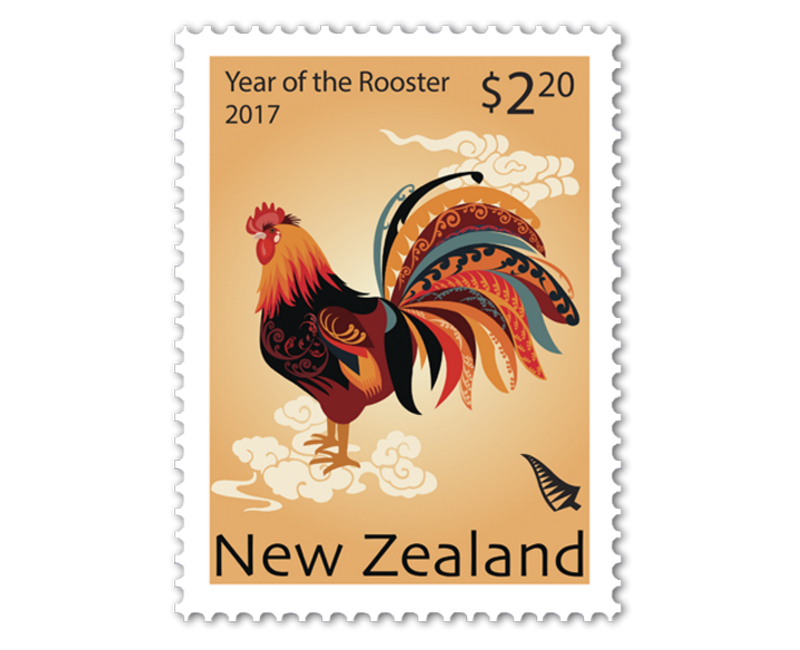 This illustrated rooster is rich with colour and incorporates various Maori and Pacific patterns, including koru, that are symbolic of new life. 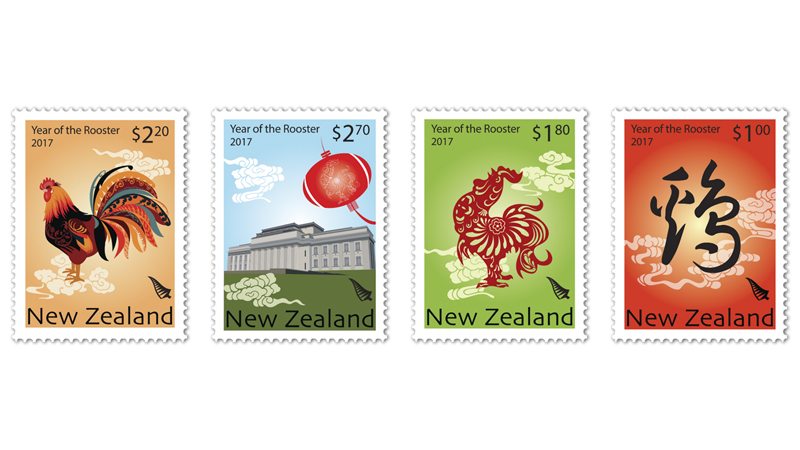 The black colour in the design reflects New Zealand’s national identity, and blends harmoniously with the red tones that are popular in Chinese culture. 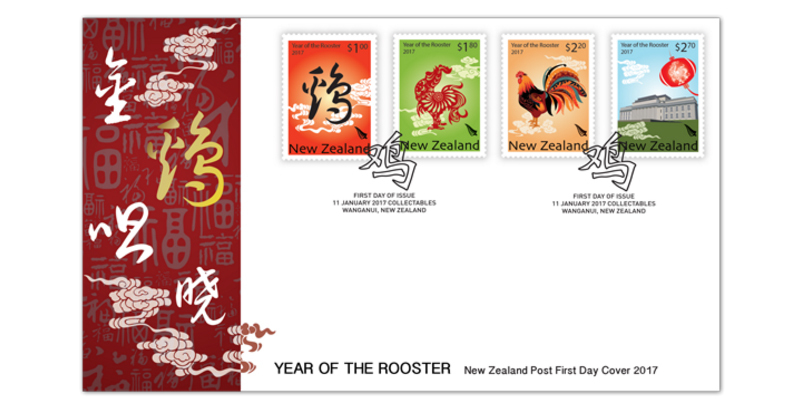 The attractive-looking rooster reacts the pride that those born in the Year of the Rooster take in their appearance. The Auckland War Memorial Museum is located in Auckland Domain, which in 2016 was the venue for the Lantern Festival for the rst time. Hundreds of handmade Chinese lanterns were displayed in front of the Domain and more than 100,000 people attended. The festivities included on-stage performances and Chinese art, handicrafts and delicacies, and culminated in an impressive reworks display. The miniature sheet features a traditional Chinese character in the background, which translates into a blessing meaning 'all the best'. 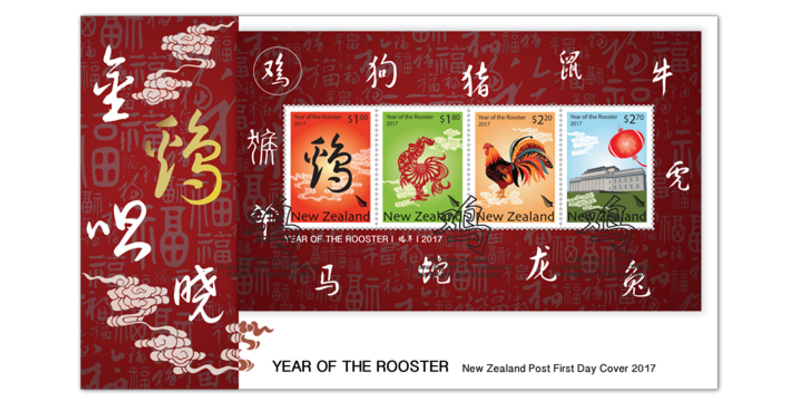 The two first day covers are sure to please - both celebrating the Year of the Rooster in a festive red - a lucky colour in Chinese culture.